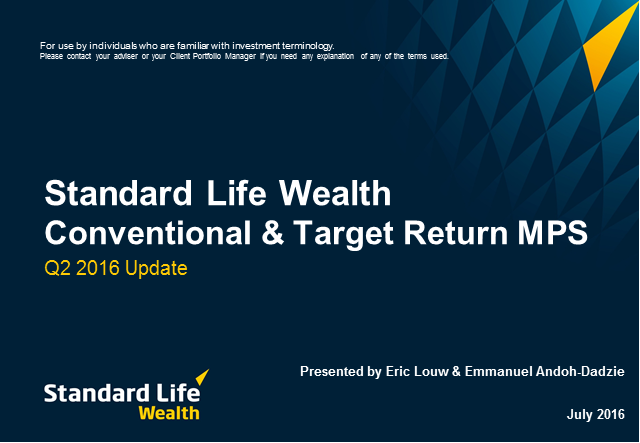 Hear the latest update on Standard Life Wealth's target return Managed Portfolio Service from our investment experts. Listen to Alan Meechan from Aberdeen Standard Capital for an update on Q4 2018 performance. Listen to investment experts from Standard Life Wealth for an update on Q1 2018 performance, including economic and market highlights. Please see below for details of time stamps, should you wish to skip to specific content. Listen to investment experts from Standard Life Wealth for an update on Q3 performance, including Q3 economic and market highlights. To jump straight to content relevant to you, please see below time stamps. Listen to investment experts from Standard Life Wealth for an update on Q3 2017 performance for MPS, including Q3 economic and market highlights. To jump straight to content relevant to you, please see time stamps below. Join our live webcast for the quarterly update from Standard Life Wealth's investment experts on the markets and how our portfolios are performing. You'll also have the opportunity to ask questions during the webcast. Hear the latest update on Standard Life Wealth's Managed Portfolio Service from our investment experts. You will also have the opportunity to ask questions during this webcast. Hear the latest update on Standard Life Wealth's Managed Portfolio Service from our investment experts. Head of Investments Darren Ripton and John Hair give the quarterly update on the markets and how the Standard Life Wealth Conventional and Target Return portfolios are performing. Hear the latest update on Standard Life Wealth's Target Return and Conventional Managed Portfolio Service from our investment experts.